Born in 1985, Vincenzo Maltempo completed his musical studies under the guidance of Salvatore Orlando (disciple of the pianist Sergio Fiorentino) graduating with highest honors from the Conservatory "S. Cecilia" in Rome - and after follows the courses of Riccardo Risaliti at the International Piano Academy "Incontri col Maestro" in Imola. A very important step to his concert career was the first prize at the prestigious piano competition "Premio Venezia" in 2006, held at the theater "La Fenice", received with great favour by audiences and critics. Following this success he has undertaken a series of concerts in Europe, Asia, USA: back to play several times to theater "La Fenice" in Venice, both as a soloist with the orchestra, he was a guest of the Accademia Filarmonica of Verona and Bologna, of the "Bologna Festival", Spoleto Festival, MiTo Festival and other major Italian concert associations. He collaborated with the Orchestra of the Gran Teatro "La Fenice", the "Orchestra sinfonica giovanile del Piemonte” the "Bacau Philharmonic Orchestra" under the direction of Ovidiu Balan, Paolo Olmi, Bartholomeus Van de Velde, Claudio Maria Micheli . He has collaborated with the pianist Francesco Libetta in various editions of the “Miami International piano festival in Lecce” playing also with him in Italy and in Japan with a repertoire for two pianos and for piano four hands. In 2012 he played for the famous and ancient "Sagra musicale Malatestiana" in Rimini an “Alkan marathon” in a three part recital and, in June of that year, he also debuted at the “Liszt Festival” in Raiding. Since 2010 he has begun a fruitful collaboration with the Conductor Gustav Kuhn, who regularly invites him to give concerts at his Academy of Montegral in Lucca (the critic Marcello Filotei after one of his recitals writes: "phrasing elegant virtuosity never ostentatious, mastery of form and musical sense. Jot the name of gentlemen, a pianist is born! "), for the “Erl Festspiele” and for the "Festival-suedtirol" in Dobbiaco, where he had the opportunity to propose his own transcription for solo piano of the "Sinfonie in E" by Hans Rott. Infact he also composed some transcriptions of major orchestral works which are published by the publishing house Ries & Erler Berlin. The year 2011 marks the date of a major debut at the Teatro Lirico di Cagliari, with a solo recital dedicated to F. Liszt, on the bicentenary of the birth - Gabriele Balloi calls him “a prodigy for whom everything seems to come easily, [...] with a transcendental virtuosity that does not neglect even a single note.” And it is precisely to Liszt that he dedicated his first album, recorded in 2008 for the Austrian label “Gramola” and presented with a concert at Bosendorfersaal in Vienna. Acclaimed by the critic which enhances “the infallible instinct for balance and beauty of sound; we did not hear a play "Réminescences de Norma" with so perfect phrasing and with such a sensual "bel canto" for a long time.” (R. Nemecek, Piano news). In 2012 he began a collaboration with the English record label "PianoClassics"; his 3 CDs dedicated to the French Romantic composer Ch. V. Alkan, particularly dear to him, has raised great enthusiasm getting the coveted five stars in such magazines like "Diapason" ("We must return to the pioneering - and undervalued - recordings of Ronald Smith to find an approach so healthy and convincing to the music of Alkan"), "The Guardian" ("exhilarating, a real revelation") or "Gramophone" ("In the last in a series of Alkan recitals, his playing flashes with summer lightning and a freer, more expressiv romantic leeway than either Ronald Smith and Marc-André Hamelin"). 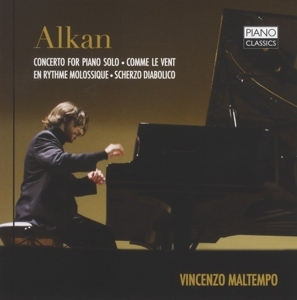 Maltempo also recorded for Toccata Classic a CD with the complete piano transcriptions by Josè Vianna Da Motta on Alkan music (along with his colleague Emanuele Delucchi, 4 hands and 2 pianos). 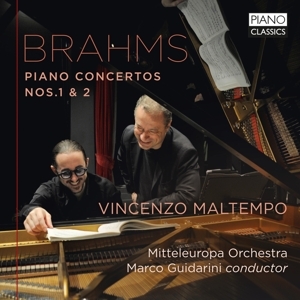 Following the success of this publications Maltempo will release a new album for PianoClassics dedicated to Schumann and a new Alkan recording dedicated to his miniatures, playing on an Erard piano. 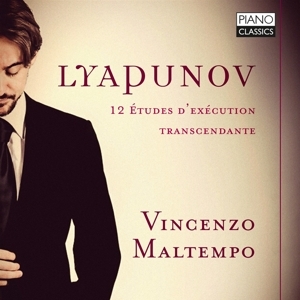 Vincenzo Maltempo is considered today one of the most remarkable Alkan interpreters (“with this passionate record Maltempo confirms his place in the restricted circle of Alkan’s best performers ever.” Diapason), and in Japan, in November 2013, he played the complete set of the Alkan’s 12 Etudes Op 39: one of the very few times in history that an interpreter play them all in a single recital. In 2014 Maltempo debuts in the "Miami Piano Festival" in Florida (USA) has recieved a big acclaim both from audience and critic, so he will a guest of the Festival again in 2015 and 2016. After the success at the piano competition in Venice he is on the podium of other International Competitions: in 2008 he is First Prize at the International Competition "F. Liszt "of Grottammare (Italy) and in 2012 unanimous First Prize at the International Competition "G. A. Fano" with Leslie Howard as President of the jury. In 2013 he was asked to be a member of the Jury of the XVII “S. Rachmaninov International Piano Competition” in Morcone (Italy). Vincenzo Maltempo is among the founders and piano teacher of the "Imola Piano Academy - Talent development Eindhoven" in The Netherlands. Piano Sonata Op. 14 e.a.